A reading of the articles and reviews on the Lift Reserve web site reveals that there are various opinions on just what the LRI is and what it measures, even by individuals who like and recommend the unit. Since I am no aerodynamiscist or engineer, this review is strictly based on what I observed with my installation in 399SB, and I will make no in-depth engineering analysis since I am not qualified to do so. I am qualified, however, to report what the reader may expect to observe while using the LRI in the real world. The LRI ships with instructions on how to calibrate and use the instrument. The face of the instrument has three colored arcs; the green arc indicates a flight configuration with abundant lift, the white arc shows a transition through a flight phase of lift at high angle of attack, and the red arc indicates that the AOA is sufficiently aggressive to prevent lift from being generated. The only point that needs to be calibrated is the AOA at which the wing can no longer produce lift. I climbed to a density altitude of 5000' and began a deceleration (flaps up) of about 0.5 mph/second. The manual suggests approaching stall speed with full or cruise power, but the deck angle on an RV at high power and stall attitude is very steep! Consequently, I pulled power back to 1400 rpm and slowly decelerated to stall speed. As the speed decayed through 110mph, the LRI needle dropped off the right hand peg and slowly headed for the white arc. At 70mph, the needle reached the white arc, and as the stall gently broke at 60mph indicated, the needle was exactly on the transition between the white and red arc. The estimated aircraft weight for this test was 1350 lbs. It appears I lucked out and got the calibration dead on with the initial setup; zero lift at the red/white mark is what is suggested in the instructions. Since bringing in flaps effectively changes the incidence of the wing, I repeated the test with full flaps. This time the stall was more abrupt at 58mph, and the LRI needle was halfway into the red arc. This means that for all practical purposes, the red/white mark can be used as a benchmark for wing stall, and when carrying some flaps there will be a cushion in the indicator. I repeated each of these tests several times with consistent results. Next step was a visit to a friend's short grass strip to see if the LRI would enhance a short field approach. Since an approach with the LRI needle at the white/green mark would occur at 70 mph, leaving a safe margin above stall, I set up the approach and flew the LRI with only occasional crosschecks with the uEncoder airspeed indicator. I must admit that 70 mph was a little slower than I was accustomed to comfortably flying into Spry International (1800' grass, one-way) but seeing the LRI needle hanging on the white/green mark gave me confidence to continue the approach since I could visually see how far above stall I was flying. Needless to say, the rollout was shorter than usual and ended a fine short field landing. At this point I was beginning to get very interested in what the LRI was capable of showing. In both instances of short field landing and takeoff, the LRI gave me a great visualization in how close I was flying to actual stall speed. I realize that in the initial test phase of our aircraft we should establish the reference speeds, but as we accumulate hours on the plane, those reference points can get hazy, especially if we don't often use them. With the LRI, those V-speeds are right in front of my face at all times, instantly available if the need arises. Cool! Now, just what do we have in the LRI? Is this unit an accurate indicator of wing angle of attack or is it just an expanded scale airspeed indicator? In either case it is a useful instrument since the typical airspeed indicator is notoriously inaccurate at low speeds, but the LRI is marketed as a type of AOA indicator. To test this premise, it was necessary to see if the LRI predicted stall at various aircraft weights. The wing will stall at the same AOA regardless of weight, but the airspeed will be higher as the plane is stalled at heavier weights. This is the utility of an AOA indicator since the plane can be safely flown above stall speed regardless of density altitude and aircraft loading. Fortunately I didn't have to go far to find suitable ballast for the next phase of tests. After filling the plane with fuel, RV-8 builder and 230 lb pilot Robin Hunt firmly planted his, uh, self in the right seat and we were off for another look at the stall characteristics of 399SB when it was loaded at an estimated weight of 1650 lbs. After climbing to a density altitude of 5000' (easily determined with the RMI uEncoder), we went through the same stall series as before. This time the IAS was 76mph when the LRI needle hit the green/white mark, and the plane stalled with flaps up at 66mph IAS instead of the previous 60 mph. However, the stall occurred within a needle-width of the red/white mark just as before when the plane was much lighter! The full-flaps stall was at 62mph IAS verses 58mph, and likewise was indicated on the LRI at nearly the same as when at the lighter weight. So.....I believe we have a bonafide angle of attack indicator in the LRI. The pilot should be able to depend on the LRI to indicate when the plane will stall regardless of loading and density altitude. In the weeks to come I plan to calibrate the instrument for other V-speeds such as best glide, Vx, Vy, etc. There may very well be situations at the extremes of the performance envelope when the LRI will be less accurate, but as far as I am concerned, for day-to-day flying, the LRI shows an accurate picture of where the flight is located in the performance envelope. This is good! I foresee really enjoying having the Lift Reserve Indicator in the panel, and I must confess that I am already using the LRI as the primary indicator for landing approaches (and flying slower approaches!). The recent price reduction brings the unit to a reasonable price point that can be justified by nearly all builders/pilots. Knowing just how close the aircraft is to stall speed is worth a bunch in piece of mind and intact airframes. 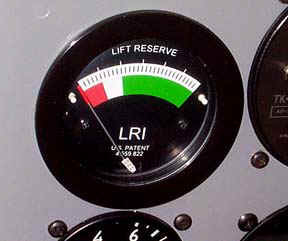 Any instrument that will contribute to safety and longevity of the pilot and occupants is worth a close look, and I think the Lift Reserve Indicator fits that purpose very nicely. Update: The RV-6 now has a Dynon D10-A EFIS in the panel which includes an angle-of-attack indicator. This system is usually driven by the Dynon AOA/pitot probe. However, since the LRI probe is already on the plane, I plumbed the probe to both the LRI indicator and the Dynon. The advantage of sending AOA sensing to the Dynon is its audible alarm. I now watch the LRI indicator as the primary instrument, but the Dynon will loudly indicate loss of lift as well. This removes the LRI shortcoming of not having an audible alarm. The Dynon AOA calibration routine has plenty of bandwidth to accommodate the LRI probe data.